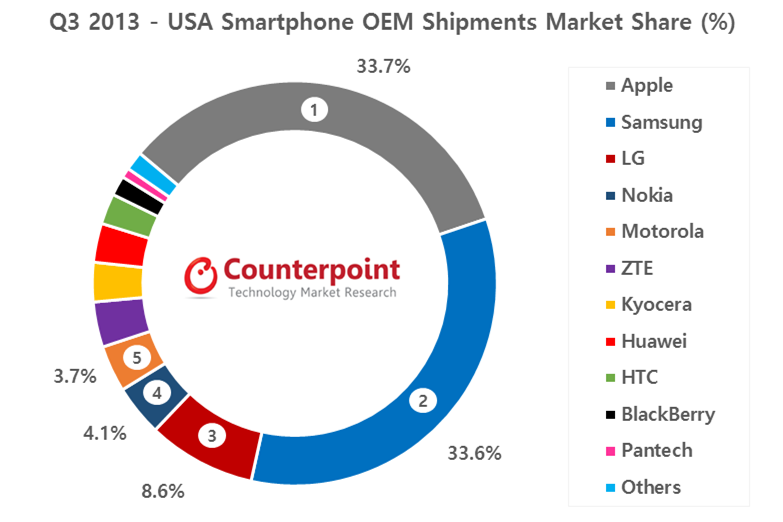 According to a new report from research firm Counterpoint, Nokia became the fourth largest OEM to ship smartphones in the US for Q3 2013. The Finnish company came in at fourth place with 4.4 percent, behind HTC which held 8.6 percent. There’s a big gap after that though, with Samsung and Apple supposedly neck and neck at 33 percent of the US market. Overall, Windows Phone held just 2 percent of the market worldwide but it seems that Nokia is slowly regaining some share thanks to shipping more Windows Phone devices than any other company. The company shipped 1.4 million Lumia handsets to the US in Q3, with the large majority of those being the low-cost Lumia 520.